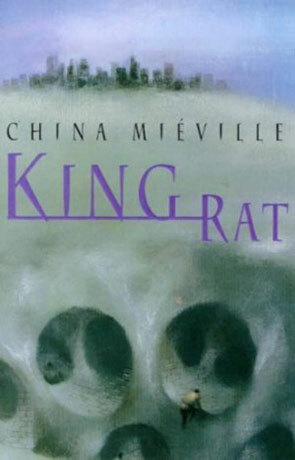 King Rat is the debut of the award winning British author China Miéville. The novel begins with Saul returning from a camping trip to the top floor flat he shares with his father, deciding not to wake him he goes straight to bed. In the early hours of the following morning he is rudely awakened by the police breaking down his door and is dragged straight to a police station without any real explanation. Eventually interviewed, he is told that his father has been murdered - pushed out the top floor window and without given time to grieve or grasp the reality of the situation (he must have been fast asleep when the murderer struck) the detectives accuse Saul of being the killer. While lying dazed and distraught in a cramped police cell he is visited by a weird, sharp featured and enigmatic gentleman who leads him in an impossible escape. The strange gentleman then claims to be the King Rat and that Saul is his nephew, half rat and a prince of the Rat Kingdom along with the legacy of rat (super)powers (near invisiblity and monumental strength included). This is the second China Mieville novel I've read, following the incredible Hugo award winning "The City and the City". Regular readers may recall I pledged to read all of China Mieville's works and it only seemed right to start at the beginning with his debut "King Rat". The story combines elements of classic fairy tale mythology along with the Rat King phenomenon then adds modern elements (such as the "drum n' bass" scene) to create a unique and completely mesmerizing urban fantasy based in my favorite city - London. If I hadn't read that this is Mieville's first book I would never have been able to tell, the prose is incredibly rich, dynamic and mature with a command of language that is rarely seen. He manages to forgo most narrative conventions and just create his own, a skill that few authors can master without a novel becoming unintelligible. King Rat is written in a very different style to the City and the City and is much easier to read and more accessible, I managed to complete the whole book in a few hours (although I do read fast). The main protagonist of Saul Garamond is a fairly troubled young man who has a great deal of frustration and anger, which his well meaning but inexpressive father receives the brunt. They both clearly care a great deal about each other but are almost polar opposites and don't seem to understand each other at all. The characters of King Rat are vibrantly colourful and yet dark and seedy at the same time. I love the way that the otherwise ordinary Saul is turned into some sort of dark, weird fantasy superhero and this is played out to great effect, there is one very memorable scene that almost seems to poke fun at the superhero who has just discovered his powers scenes of the many recent comic book adapted films (remember though this was written in 1998, prior to most of them). As with "the City and the City" the background details are given out in small snippets of information as the story progresses and again this works very well, Mieville's incredible command of the English language manages to create an evocative, dark, grungy and ocasionally odoriferous feel that successfully combines fairy tale, urban life, grisly murder and the hidden fantastical world of the Rat King into an utterly unique story that hold's the attention completely. King Rat is an incredible fantasy journey that stands out with a strong voice and powerful, creative wordplay, you may never see a rat in quite the same way ever again. Written on 26th February 2011 by Ant.